Symon, Michael. With Trattner, Douglas. May, Jennifer (Photography). 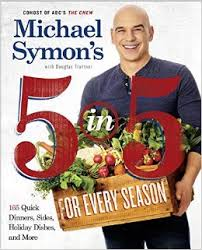 Michael Symon’s 5 in 5 For Every Season: 165 Quick Dinners, Sides, Holiday Dishes, and More. NY: USA: Clarkson Potter/ Publishers. 2015. 5 fresh ingredients + 5 minutes of heat= 165 recipes…that just about sums up the new cookbook by co-host of The Chew, author and chef, Michael Symon. Through trips to the farmer’s market, a little bit of time, cost-saving strategies and fresh recipes, 5 in 5 For Every Season makes home-cooked meals from scratch, a cinch. Using ingredients in season and a touch of creativeness, this cookbook will help most anyone succeed in mastering delicious, healthy, attainable meals. Always looking for quick, interesting, and tasty meals for my family, I was excited to try Michael Symon’s new book. Already a fan of his show as well as a frequent patron of farmer’s markets, this book brought those together for me and proved to be a success. Upon first perusal, the pictures grabbed my attention, closely followed by the easy yet satisfying recipes. An added bonus- the easy ability to exchange ingredients should one not be a favorite, with the result just as appetizing. Included is a section on holiday cooking, perfect for the upcoming holiday meals. For my family, 5 in 5 For Every Season definitely was an inspiring find to cook often and enjoy further! This entry was posted in Cookbooks, Healthy Lifestyle and tagged Cookbook, Healthy Lifestyle, Ingredients, Inspirational, Michael Symon, Recipes, The Chew by Savurbks. Bookmark the permalink.